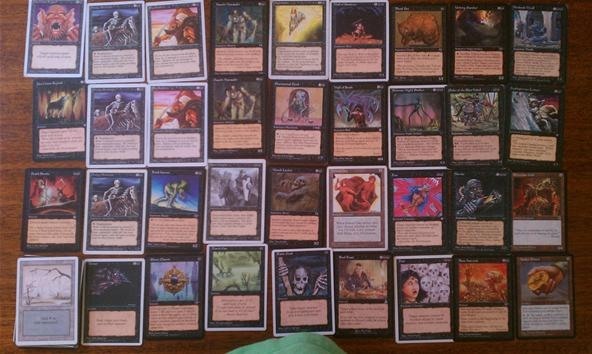 28 Swamps is a ton of Land for a mono deck. But as long as you don't go on a paralyzing all-Mana run (you'll almost never have a shortage) you're pretty much set. The deck was designed around utilizing any extra Mana you might have to empower your creatures. A LOT of the many creatures in this deck crave Mana. 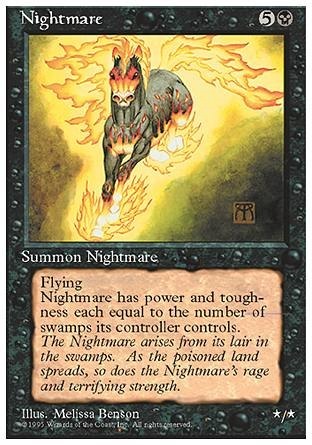 Fetid Horror, Order of the Ebon Hand, Nightmare (in an even more awesome way), Howl From Beyond (not a creature, but hey, we like all flavors), Phantasmal Fiend, Marsh Lurker. All of those cards crave tons of swamps, and this deck gives it to them, allowing you to deal jacked up damage early and often until you get to watch your friend sob as he packs up his deck, one of my favorite sights in MTG. Almost everything else in the deck is geared towards making you hard to hurt: regenerating weenies (Drudge Skeletons), indestrubtible walls (Shadows and Souls), some nice killing spells (Terror, Death Stroke), regeneration spells (Bone Harvest, Raise Dead). Even a couple Dauthi Marauders for consistant damage and Shadow defense. It is incredibly hard to damage and not be damaged by this deck. There are problems, however. You may have noticed that there isn't a single card that can stop or destroy a spell of any kind. Blue decks particularly can rock it by making attacking difficult, but even if you opponent uses Propaganda or a simliar card to stop your attacking you probably have enough Mana to circumvent it. There are so many creatures to that even if opponents nerf a few with Pacifism or Gaseous Form you probably have more coming up on the next draw. If you think you've got a deck that matches up, post it! Otherwise, bask in the majesty and work on finding a Nightmare for yourself if you don't already have one.